We’ve always been open about sharing the Little One’s bone and joint injuries and issues, so here is our latest adventure in orthopedics. I know some of you have very strong opinions about the need for bubble wrap and some of you live in the “kids will be kids” camp. I am somewhere in the middle. What I have learned over each visit is everyone has an opinion, and I, as the mom am just doing the best I can to manage risks while allowing the Little One to just be the Little One. Today, as I got a little emotional with the orthopedic doctor, he assured me (again) that she is fine. She is normal. There is nothing wrong with her. There is nothing wrong with her bones. There is nothing wrong with the way we parent her. He, himself had 13 broken bones before he turned 13 so he knows what we are going through. Last week the Little One was at a friend’s house playing on the trampoline. As she tried to do a handstand on the trampoline, her friend some how hit her foot causing the Little One to twist her ankle awkwardly. She was in immediate pain, but was able to bear some weight so we RICEd it for a week. (rest ice, compress and elevate). She went through the typical ankle injury symptoms of swelling and bruising. We used lots of ice and Ibuprofen during the week. Her pain was not getting better so I took her in to see her pediatrician yesterday (Tuesday, one week since the injury). 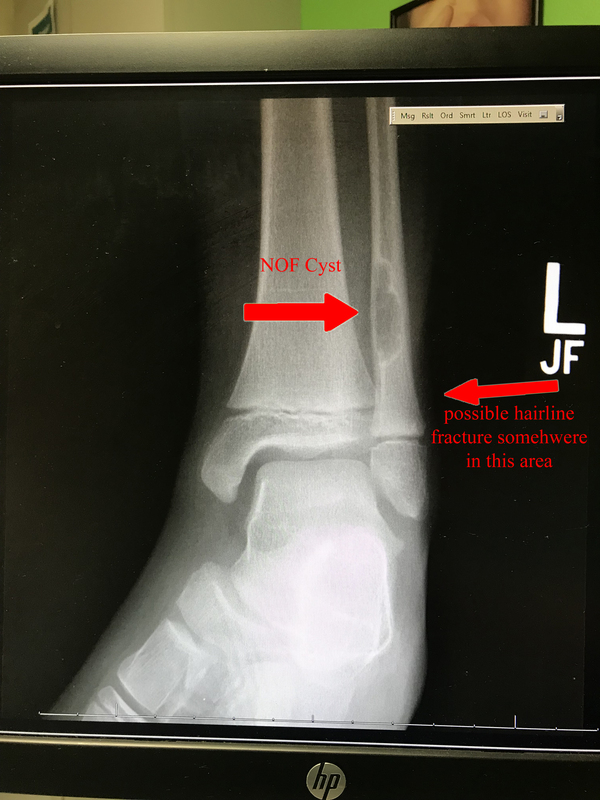 The x-rays showed no ankle fracture just a sprain (ATFL – anterior talofibular ligament injury), but also a “large mass” above the ankle joint. So, we got a referral to orthopedics and by some miracle got a next day appointment. Today we went to orthopedics. We learned that the “large mass” is most likely an NOF cyst (non-ossifying fibroma). It is a benign bone tumor that is fairly common in kids. Typically, they will resolve on their own. As the bones continue to grow, this bubbly blob-like cyst will fill in on its own. In some cases, surgery is required to remove the cyst or there are also injectable treatment options to fill in the space. We are hoping that neither of these options are required. We will wait and see. The doctor told us that based on the size of the cyst, it’s likely been growing for at least five years. My understanding is that this type of cyst grows out of the growth plate. There isn’t a lot of statistical data on them because not everyone gets an x-ray. These cysts are discovered by chance, typically because of another injury or unexplained pain. The other thing we learned is that the Little One also, most likely, has a hairline fracture in her fibula just below the cyst. The cyst can cause weakness in the bones, so when the ankle twisted the cyst had weakened the bone causing the hairline crack. Of course, we won’t know for sure until they take more x-rays and compare them to see if there is any changes/healing in the area under the cyst. So now she is in a boot for four weeks. Not fun at all. We will gladly take an arm cast over a foot injury any day of the week. At least the boot can come off for showering and sleeping. She can’t do any PE for one month. Fun times. She is allowed to swim, walk in the water and can ride an exercise bike. Anybody got one of those laying around that they don’t use anymore? I wish Little One a full recovery, and you, peace of mind. Thank you Sue! I appreciate it. Happy new year!